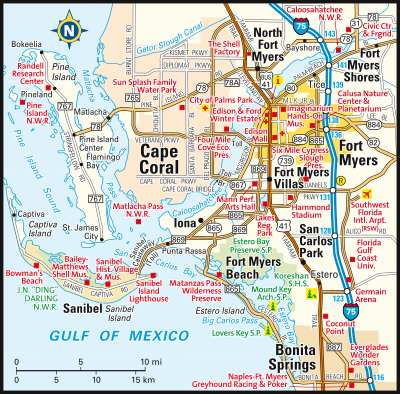 Home to approximately 44,000 residents, the splendid community of Bonita Springs, Florida, is located in Lee County in the Cape Coral-Fort Myers Metropolitan Area on the southwest coast of Florida. Sitting on the gorgeous Estero Bay and the Gulf of Mexico, Bonita Springs is composed of roughly forty-one square miles. Among its many beautiful natural features you’ll find Bonita Beach which is located on Little Hickory Island, a road-accessible barrier island between the By and the Gulf. Another noteworthy feature is the Imperial River, flowing through Bonita Springs and into the Bay, the River affords Bonita Springs residents with many wonderful opportunities for recreation and leisure activities. Not only does Bonita Springs boast abundant and undeniable natural beauty, this remarkable community also has wonderful real estate options. Homes for sale in Bonita Springs come in a wide variety of ages, sizes and architectural styles, including townhomes, condos and single family homes. Bonita Springs homes are found in a myriad of excellent neighborhoods and subdivisions from which prospective homebuyers can choose. For example, the Bonita Springs community known as Sorrento is located off Bonita Beach Road and comprised of 152 beautiful carriage homes. The Sorrento neighborhood has homes of two floor plans, one with 1401 square feet of living space, two bedrooms and two bathrooms and the other with 1,661 square feet of living space, three bedrooms and two bathrooms. Like many other Bonita Springs communities, Sorrento boasts impressive shared amenities including a fitness center, clubhouse and resort-style swimming pool. This gorgeous neighborhood is only one of many luxurious options in Bonita Springs. Homes for sale in Bonita Springs vary in price depending upon the property’s age, size, architectural style, location and special features. The average listing price for a home in Bonita Springs is around $630,000. When you buy a home in Bonita Springs, you will be delighted to find quick and easy access to excellent shopping, dining and entertainment. The Gulf Coast Town Center, Coconut Point and Miromar Malls are all in close proximity. Also nearby you’ll find the Germain Arena, Interstate 75 and the International Airport. Additional shopping and dining possibilities abound in the Mercato and Vanderbilt Beach areas, as well as at the Bonita, Lely and Barefoot beaches. With all of these exceptional amenities and amazing features, not to mention the gorgeous real estate options, it is no wonder Bonita Springs continues to be a popular southwest Florida destination. If you would like more information regarding homes for sale in Bonita Springs, Florida, or you have questions regarding other real estate options in southwest Florida, please do not hesitate to contact us today.